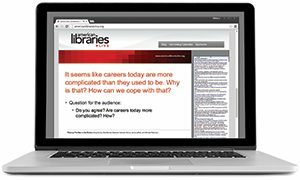 Librarians know that technology is as much a part of the modern library as books are. The following facilities have incorporated technology into their construction projects in innovative ways. Technology Enabled: Bierce Library’s renovation is intended to create a contemporary learning commons that facilitates interaction between students and staff and provides easier access to information through the use of technology. An emerging technology lab houses hands-on exhibitions of the latest technology, while the technology-enhanced formal learning studio supports problem-based learning and multimodal instruction. 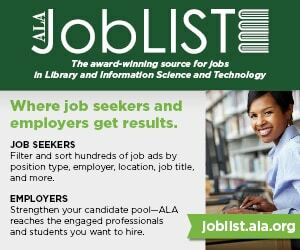 Technology Enabled: The North Branch Library boasts 36 public computers, as well as a lab with 12 more workstations for computer classes. Two meeting rooms each have LCD projectors and screens, as well as internet capability. Wireless is available throughout the facility, including in meeting rooms and on two reading decks, and some of the seating options are specially designed to incorporate laptops. Technology Enabled: The renovation of the Hill Library created spaces with extensive power outlets to support students with laptops. 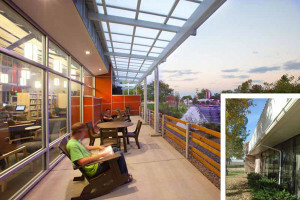 The outdoor terrace has seating for 54 with power outlets around the entire space, including in the railing. The silent reading room seats 70 and has outlets in floorboxes and the exterior glass wall. A technology sandbox area offers access to large-scale display and gesture-based computing tools. Technology Enabled: Middle Country Public Library’s renovated teen space, dubbed The Underground for its physical location in the library, has a multipurpose computer area with both Macs and PCs. A separate media counter offers charging stations for laptops and cell phones. Size: 5,000 sq. ft. renovated, 77,000 sq. ft. total. Technology Enabled: The renovation of the Evander Childs High School Campus Library Media Center included custom computer pods and computer stations. An Information Hub was designed to create a focal point for user assistance. The project restored a hidden and forgotten skylight, while blending technology and contemporary elements into a historically sensitive environment with murals and original casework. 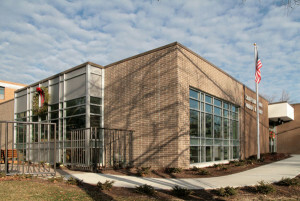 Technology Enabled: The renovation of the 1939 Petworth Neighborhood Library thoroughly modernized the space, eliminating partition walls and upgrading the building’s mechanical and electrical systems. Also upgraded was the library’s internet connection, funded by the Broadband Technology Opportunities Program. Nods to tradition include the restoration of original oak woodwork and the creation of a cupola and exterior balustrade, which were planned for the original construction but never built until now. Technology Enabled: Reconfiguration of the San Marcos Branch’s circulation area, which consolidated circulation and reference into one service point, allowed the library to create a self-service area without expanding the library building. This space includes RFID self-check-out machines, printers and copiers, and a request pickup area. Improved wireless access and a dedicated laptop bar in the teen space serve computer users, as does a new glass-enclosed computer lab. Technology Enabled: Plasma screens throughout the England Run library display program details and other library information. Walk-up computers serve customers who need to quickly check email or the library catalog, while the library also offers other computers for more involved work, as well as Wi-Fi. Technology Enabled: The renovation of the fourth and fifth floors of Bobst Library into a Graduate Research Commons created a space tailored for digitally equipped users that will serve as a template for future phases of the library’s renovation. The commons includes a digital studio with powerful software for audiovisual projects, and a Data Services Studio with equipment focused on geographic information system data and mapping. Both are enclosed with wood and glass partitions to provide security while maintaining visual continuity with the rest of the library. Technology Enabled: The renovation and expansion of Santana High School’s library remedied a serious lack of computers: a 30-computer lab couldn’t accommodate the average class of 35–40 students, let alone walk-in students, and a domed skylight in the space echoed noise, making the lab uncomfortably loud. The new glass-enclosed computer lab has an LCD projector, screens, and outlets to allow students or teachers to make presentations, and a separate computer bar serves walk-in students. Technology Enabled: Teens have been heavy users of the Blair Library since it opened in 2004, and have long needed more computers and space for group projects. 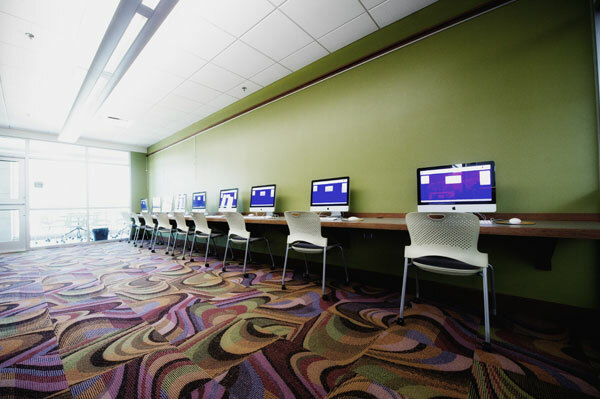 An expansion and renovation created a new space, dubbed the Otwell Teen Library, with Wi-Fi, two 37-inch digital signs for teen event information, a technology center with 25 computers, three collaborative workstations, and a gaming center. Much of the construction material is recycled, including countertops made from shredded milk jugs and laundry bottles.